London's savviest street sorcerer is a foul-mouthed, cynical, chain-smoking con man, but sometimes he's also our only hope. All of these facets of Constantine's character have made him one of the most popular figures in graphic literature. John Constantine, Hellblazer: 30th Anniversary Celebration collects some of the antihero's greatest stories from some of comics' greatest writers, including Alan Moore, Jamie Delano, Neil Gaiman, Garth Ennis, Brian Azzarello, and Mike Carey, and also features a foreword written by worldwide musical icon Sting! When all the chips are down and everything's on the line, what would you do to come out on top? What would you be willing to sacrifice? How many friends and loved ones would you let suffer or die before it became too much? For occultist John Constantine, the only thing more difficult than answering that question almost every single day is living with his decisions. Whether it stems from a sense of self-loathing, a resistance to any sort of authority, or a deeply hidden desire to do what's right, Constantine is willing to make the hard choices...so that no one else has to. 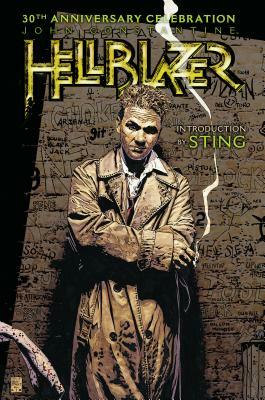 Featuring an introduction by musician, actor, and singer-songwriter Sting, whose appearance, career, and mystique inspired the creation of John Constantine, this volume presents Constantine's first speaking appearance in Saga of the Swamp Thing #37, as well as his adventures in John Constantine, Hellblazer #11, #27, #41, #63, #120, #146, #229, and #240. Also included are four essays exploring the history of Hellblazer, along with the first-ever complete timeline of John Constantine's life up through his long-running Vertigo series, all by author Rich Handley.